The Master of Science in Physician Assistant Studies (MSPAS) at Milligan is a 28-month, 108-credit hour program that prepares highly trained healthcare professionals with a foundation in primary care to work with physicians and other members of the healthcare team in a variety of medical specialties. Applicants must have an earned bachelor’s degree and have completed the prerequisite requirements for admission to the program. Milligan’s MSPAS program has received the status of Accreditation-Provisional from the Accreditation Review Commission on Education for the Physician Assistant (ARC-PA) and began its first class in January 2018. The program has since started its second class in January 2019. Graduation will take place in May of each year, beginning in 2020. 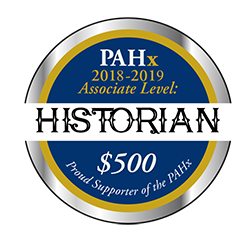 PANCE first-time test taker pass rate data and data related to the success of the program in achieving its goals will be available here upon completion of the first cohort of students. 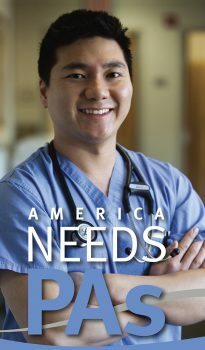 Mission: To prepare physician assistants as servant leaders who provide clinical expertise while making positive contributions to the profession, the communities they practice in, and society as a whole. The Accreditation Review Commission on Education for the Physician Assistant (ARC-PA) has granted Accreditation – Provisional status to the Milligan College Physician Assistant Program sponsored by Milligan College. Accreditation-Provisional is an accreditation status granted when the plans and resource allocation, if fully implemented as planned, of a proposed program that has not yet enrolled students appear to demonstrate the program’s ability to meet the ARC-PA Standards or when a program holding Accreditation Provisional status appears to demonstrate continued progress in complying with the Standards as it prepares for the graduation of the first class (cohort) of students. Accreditation-Provisional does not ensure any subsequent accreditation status. It is limited to no more than five years from matriculation of the first class. Institutional accreditation: Milligan College is accredited by the Southern Association of Colleges and Schools Commission on Colleges (SACSCOC) to award baccalaureate, master’s, education specialist, and doctorate degrees. Contact the Commission on Colleges at 1866 Southern Lane, Decatur, Georgia 30033-4097 or call 404-679-4500 for questions about the accreditation of Milligan College. The faculty of the Milligan College Physician Assistant Program are committed to preparing PAs as servant leaders with clinical expertise. Combined, our faculty have over 40 years of clinical experience in multiple different specialties along with many years of teaching experience. Four of the faculty members are certified physician assistants who practice clinically, while two other faculty members hold a Ph.D. Our faculty members value Milligan’s longstanding tradition of forming great mentoring relationships with students, and they are dedicated to ensuring that students are successful both during the program and as practicing PAs. A financial investment from Ballad Health (formerly Mountain States Health Alliance) has established the Ballad Health Physician Assistant Center, housed in Milligan’s B. D. Phillips Building. This area has three private exam rooms equipped with appropriate medical equipment along with a larger space that has an open floor plan with 13 patient exam tables. 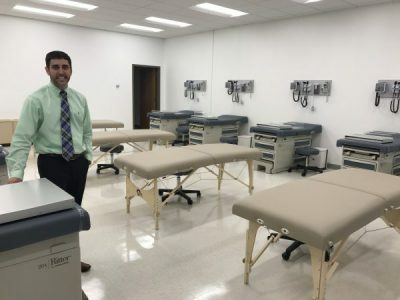 Eight of these exam tables are equipped with medical equipment including ophthalmoscopes, otoscopes, blood pressure cuffs, thermometers, wall desks, and privacy curtains that separate each area. The Center is used to train students in a wide array of clinical competencies, including communication, history taking, physical examination, counseling, and patient safety. Clinical skills training, such as practice with urinary catheter trainers, IV injection manikin arms, casting, and suturing, also take place in the Ballad Health PA Center. In addition to brand-new facilities, recent renovations to Milligan’s Science Building and expansions to its gross anatomy lab allow physician assistant students to participate in dissection of cadavers. The program’s close proximity to other healthcare programs, which allow for numerous interprofessional education opportunities, and the Johnson City Medical Center, a reputable tertiary teaching hospital, are other advantages that set the college’s physician assistant program apart from many other programs. All applicants to the Milligan College Physician Assistant Program must apply through the Central Application Service for Physician Assistants (CASPA). The application cycle for the class that begins in January 2019 is now closed. The application cycle for the class that begins in January 2020 will open April 26, 2019, and the application deadline will be September 1, 2019. All applications must be verified on or before this date. Applications that are not verified by this deadline will not be reviewed. Selected candidates will be considered for a face-to-face on-site interview. Each cohort/class will have a maximum of 26 students. No advanced placement status will be given to students in the program. The Milligan PA program utilizes a rolling admission process, meaning we review applications as they are completed and make decisions throughout the admissions cycle until the class is filled. Applicants should apply as early as possible and check the CASPA site frequently until all requirements including references have been submitted and the application is complete. All applicants who are offered a seat of admission will be required to pay a $1000 non-refundable deposit which will be applied to your account upon matriculation. A baccalaureate degree with a minimum cumulative grade point average of 3.0. Three completed reference forms through CASPA from persons who have adequate knowledge of the applicant’s Christian commitment, character, and professional qualities of potential for success as a graduate student. At least one reference must be from someone with/for whom the applicant has worked/volunteered in a health care setting. *courses must include live hands on lab; courses with online laboratory will not be accepted. More competitive applications will show successful completion of science courses that are above the introductory or “essentials” level. Substitution or waiver of a requirement for any of the above prerequisite courses may be granted by the Physician Assistant program admissions committee on an individual basis. Prospective students meeting the minimum admission criteria will be considered for a face-to-face on-site interview. However, meeting the minimum requirements guarantees neither an invitation for a face-to-face on-site interview nor admission to the program as most if not all successful applicants will generally exceed these minimum requirements. Selection for the physician assistant program is very competitive, and all parts of each application are reviewed including undergraduate cumulative and pre-requisite course GPAs, health care experience, letters of reference, personal statement, and GRE scores. Personal interviews with the principal physician assistant faculty will be required for final admission and will be offered only to the most qualified individuals. Final selection of students will be made by the admissions committee of the Physician Assistant program. See the Admission section above for interview and admission timeline. If you are an international applicant, please have your Test of English as a Foreign Language (TOEFL) score sent directly from the Educational Testing Service to Milligan’s PA Admissions Office. All international applicants must have taken the TOEFL within the last two years. You cannot be exempted from this requirement unless English is your native language, you are a U.S. citizen, or you have received an undergraduate or graduate degree from an accredited U.S. college or university. The Milligan PA program is priced competitively, and we will work with you every step of the way to help investigate all the options available for financing your education. The tuition rate for 2020 is $770 per credit hour, for a total approximate tuition cost (108 credit hours) of $83,160 plus applicable fees. This is a rigorous, full-time, 28-month academic program. Employment of any type while enrolled in this program is not possible. The Milligan College Physician Assistant Program Advisory Committee serves the PA program by being an advocate for the program in the community and by assisting the program in maintaining and improving all aspects of the program, especially the clinical phase. The Committee also serve the program by providing increased communication between the program and community leaders to help faculty members have a better understanding of the community outlook of the program, to create better learning opportunities for students, and to provide a connection for potential employment opportunities for graduates. The PA Program Advisory Committee is composed of healthcare professionals, leaders of healthcare organizations, Milligan College faculty and staff, the PA program director, and other leaders of our community who support the mission and goals of the program. Advisory Committee membership is by invitation from the program director and is based upon recommendation from program faculty, a member of the Milligan College faculty/staff, or a member of the professional community. The committee will meet on an annual basis with additional meetings to be scheduled if the need arises. We are very grateful to each member for their willingness to serve on the Milligan College PA Program Advisory Committee. Connie Pennington, MD, Colorectal Surgeon, Colon and Rectal Surgery Consultants, P.C.